The Nuclear Security Summit made its mark in Washington, DC. 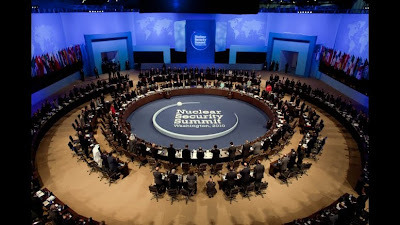 The Nuclear Security Summit has just wrapped up, and it was interesting to see how this extremely high-profile, two-day international conference was treated here in the Washington, D.C., area. On the one hand, obviously, it was a story with global relevance — a historic gathering of world leaders convened by President Obama himself — and it was covered as such by, for example, The Washington Post. But it was also a big local story, mostly because of its impact on traffic, thanks to the cordoning off of streets around the Walter E. Washington Convention Center, the diverting of more than a dozen bus lines, and the closing of a key Metro station downtown. Living through this dichotomy — massive universal import, mundane local inconvenience — has made me think about the meetings professionals who work backstage at events like this. Is it any different putting together something like the Nuclear Security Summit than, say, an annual trade show for the construction industry? Do the potentially world-changing implications lend it an emotional resonance that’s lacking from an everyday convention? Might there even be something like stage fright involved, given all the heads of state walking around and the relentless scrutiny of the international media? Or is a meeting pretty much always a meeting? The sum total of the planning and organization that goes into it?